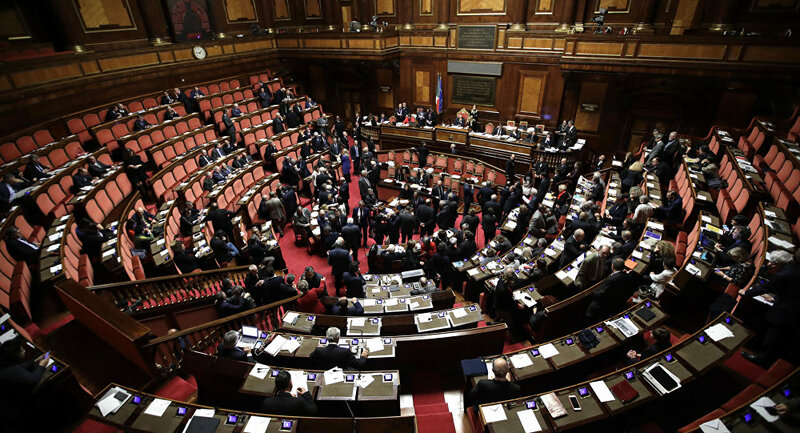 With elections just round the corner, Italian politicians are engaging in an elaborate battle of proposals to win over the swing votes. While Democrat Matteo Renzi suggests canceling annual payments for the state channel Rai Italia and abolishing university tax paid by students, Matteo Salvini from The Northern League would like to ban compulsory child vaccination. Silvio Berlusconi of Forza Italia is striving to abandon the Jobs Act, adopted by Renzi’s government, whereas Luigi Di Maio from populist movement The Five Stars is calling for the abolition of a whopping 400 laws, having launched a poll on leggidaabolire.it website. The initiatives have quickly sparked talks on social networks, now featuring a super-trending hashtag #AbolisciQualcosa (literally: abolish something). The public is giving it its best shot, demanding a ban on pizzas with pineapple, sharp furniture angles, small pasta servings, or those coughing in the cinema, or, alternatively, wearing sandals with socks. The ironic approach the netizens showed exposes their distrust in politicians. Sputnik has spoken to Federico Bezzi, a staffer of Oltre la Linea magazine and the one who tweeted the now highly trending "sandals and socks" comment. Sputnik: Federico, your tweet has been trending in all mass media. What do you think of netizens' take on pre-election promises? Federico Bezzi: When it comes to elections, it seems obvious to me that there are too few initiatives. In the recent three years we have been hearing about chaotic bills from three different governments, which citizens are truly disappointed with. The economic crunch is still there, and there’s practically no progress in view. In the meantime, politicians opt for abolishing something, rather than creating something new. Sputnik: It seems that the public does not take politicians seriously, does it, as is clear from social media? Federico Bezzi: Sure, people couldn’t take the pre-election vows seriously. There are no suggestions whatsoever, and trust in politicians is next to none. Italians don’t believe them and choose to laugh it all off. Sputnik: Election candidates are vowing to abolish everything indiscriminately. Can we say they lack a general perspective? Federico Bezzi: That’s the point. If you read these pre-election campaign programs, you’ll come to believe all candidates would prefer to abolish everything to start from scratch and fix the system which finally broke down. They are obviously more oriented at demolishing than building. There is no movement which might inspire suggesting something new. To this end, one might think of the so-called Five Stars Movement. Sputnik: Do you think the social reaction – that of laughing at pre-election promises – might change before March 4? Federico Bezzi: From this point of view, Twitter is most demonstrative of all the social networks, since it explicitly shows what’s trending now. Everyone uses Twitter, we all know what’s going on. The reaction to pre-election promises is very special now – people tend not to believe in them and laugh them off if only to avoid crying. Citizens would love to abolish things they don’t like. My newly popular tweet arrived as soon as I remembered what was most hated by Italians. I recalled then the notorious style of wearing sandals with socks. It is just unacceptable in the most fashion-conscious country in the world. Frankly speaking, I didn’t expect my tweet to become so popular. Sputnik: There were so many who agreed with you! Federico Bezzi: Yep, I‘ve apparently found something that no one likes. Let’s ditch sandals worn with socks – this is my pre-election campaign suggestion. The views and opinions expressed by Federico Bezzi are those of the speaker and do not necessarily reflect Sputnik's position.